If you’re looking for a way to make your Thanksgiving afternoon productive, then you can organize your holiday gift giving lists with iPhone, iPod Touch, and iPad apps. There are several high quality, reasonably priced apps in the iTunes store to prevent those frantic Christmas Eve runs, keep you on budget, and take the pressure off your short-term memory. We compiled this list to help you manage your Christmas list. The Santa’s List – Christmas Gift Organizer app for iPhone, iPod Touch, and iPad allows you to establish a holiday budget and stick with it. You will appreciate that you are not required to follow through with registrations or establish settings to jump right into creating holiday lists. From the home screen, you are encouraged to establish your holiday budget to cover all of your gifts. You navigate the app and add gifts and recipients through the menu at the bottom of the screen. As you purchase and check off gifts on your list, your budget is decreased accordingly. A great feature is the ability to email a pdf of your gift list, so you can share the gift-buying responsibility with loved ones. The Santa’s List – Christmas Gift Organizer app for iPhone, iPod Touch, and iPad app integrates with Facebook, but this does not enhance the functionality or experience of the app. This is a solid app for a reasonable $1.99. If you are looking for an uber-organized app for Black Friday madness, then The Christmas List app for iPhone, iPod Touch, and iPad is a fantastic choice. The app opens with a countdown clock to keep you appropriately paranoid and on-task during the short holiday shopping season. To protect the list from the snooping eyes of your loved ones, The Christmas List app suggests you set a passcode. You have the opportunity to choose custom graphic backgrounds and gravatars for your groups, as well as upload photos of your recipients. Your groups allow you to identify business recipients, friends, and family. For each recipient, you have an extensive, well-designed list that helps you identify gifts, determine what is ordered and wrapped, distinguish between a preferred gift and a must have, as well as create a shopping list. For every gift, you add a store or choose from a thorough list of bricks & mortar stores. From the home screen, you see your lists by group, person, or store. When you walk in to Best Buy, the store’s list appears with a tap on the screen. The Christmas List app for iPhone, iPod Touch, and iPad will make for an efficient Black Friday and will quickly pay for itself, if it prevents you from standing in line twice at Best Buy. If your holiday shopping will be dictated by rigorous and strict budgeting, then the Christmas Gifts List app for iPhone, iPod Touch, and iPad will be .99 well spent. You’ll notice the graphic juxtaposition of the blinking lights and falling snow with the get-to-business style list of gift recipients. The clean, simple interface of the app is amplified with pop-up cues to guide you through the app. You add a recipient and a budget for each. This is the great feature and hook of the Christmas Gifts List app. Every recipient has a specific budget, as your mom and the co-worker who creates pain daily require very different financial commitments. As gifts are purchased, then the budget ticks down. If you’re over-budget, you’ll know with a quick glance. If you need to find money for an additional gift, you can see where to trim. The Christmas Gifts List app for iPhone, iPod Touch, and iPad functions so nicely and has such an attractive functionality you’ll almost forget you’re eating Ramen for the next six weeks to pay for the gifts. For those who appreciate a visual experience, the Better Christmas List app for iPhone, iPod Touch, and iPad is a great choice. The app is graphically well-designed with a vintage, modern vibe. Many of the actions, like wrapping and shipping are displayed as an image instead of words. In fact, you can purchase graphic packages to enhance the Better Christmas List app through the settings menu on your device. Although groups like family and friends are already created for you, the app will be more effective with some set-up. For example, if you want to set up shopping lists for Black Friday, then you’ll want to add stores. And, unlike several of the apps reviewed here, you’ll appreciate the opportunity to type in copious notes to help you with your shopping. Kids are great for giving you a list with what gift will work depending on availability and circumstance. Those details are hard to track, so the Better Christmas List app for iPhone, iPod Touch, and iPad is a great choice for parents. 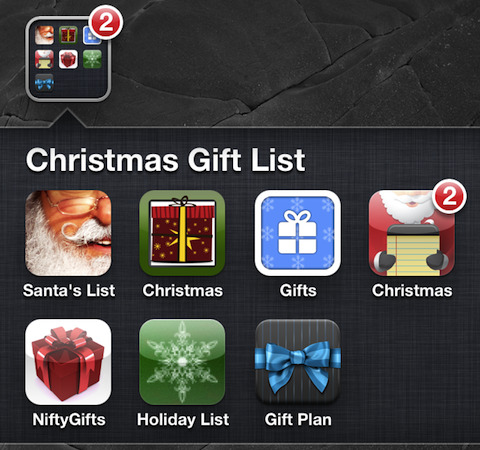 The Nifty Gifts for iPhone, iPod Touch, and iPad is a lean, mean Christmas shopping list app. The app is navigated with helpful pop-ups and embedded directions. Where should you add a recipient? It’s on the screen where to tap. Where do you add a gift? The directions are displayed on the screen. When you need to type letters, the keypad pops up on the screen. When you need to type prices, the number pad pops up on the screen. The default currency is Euros, but is quickly changed to U.S. dollars in the options. You track your list with a quick touch to see what’s left to purchase. This is not an app for someone who loves bells and whistles. The Nifty Gifts app for iPhone, iPod Touch, and iPad is perfect for someone who just can’t keep up with a Christmas list scribbled on the back of an envelope and just wants a list on the phone. The Holiday Gift List app for iPhone, iPod Touch, and iPad has room to improve and make the $1.99 investment worthwhile. You’ll appreciate the nice, colorful Christmas graphics, and the thoughtful establishment of family, friends, and co-worker categories. But, the interface could be improved with either pop-ups to help guide you or to streamline the back and forth navigation. You click through several screens just to edit a name. The gift list does not allow for you to input pertinent details like price. With a few upgrades, the Holiday Gift List app for iPhone, iPod Touch, and iPad could be on your wish list. AppSafari review of Christmas Gift Shopping List iPhone apps was written by Jenni Ward on November 22nd, 2011 and categorized under App List, Notes, Shopping. Page viewed 6009 times, 1 so far today. Need help on using these apps? Please read the Help Page. A perfect gift this December is spreading the Christmas spirit like teaching your Kids classic Christmas Carols with Jolly Jingle App. The app is Free.